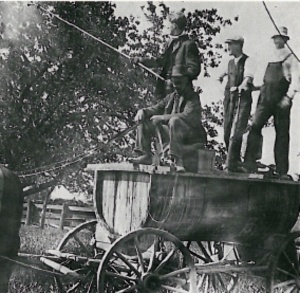 The first modern airblast sprayer was developed in the mid 1900’s, but competed with existing equipment before it was adopted by the majority. As you can see in Figure 1, we’ve come a long way. As application technology continues to evolve and grow, so does the array of choices facing growers. 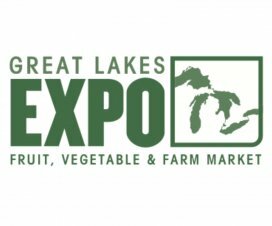 Provide Agro (a subsidiary of N. M. Bartlett Inc.) had been considering introducing a new airblast sprayer to Canada for more than ten years. After deciding not to get into the manufacturing game, they explored importing sprayers from Europe and Australia. In late 2014 they recently invited me to see their choice: the H.S.S. 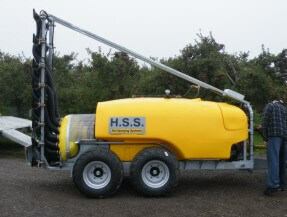 CF airblast sprayer built by Holland-based “Hol Spraying Systems”. It’s not often I get to see a “new” airblast sprayer. To be fair, H.S.S. has been building similar sprayers in Holland for more than 20 years, so technically it was new-to-me. The H.S.S. CF sprayer. Outwardly this PTO-driven sprayer appears very different from Ontario’s typical fleet of airblast sprayers. Notably the flexible ducts and gantry comprising the tower, and the double axle. However, it operates using the same principles as our more familiar sprayers and following a brief inspection of welds and fastens (and given its more than 20 year history in Europe) it appears to be very durable. Each duct is paired to a nozzle body, and that means each air outlet can be adjusted individually. The tower structure can be customized to match everything from vines to high-density orchards and even has an optional woolly aphid attachment for directing air and spray up-and-into the canopy. For taller crops like hops and semi-dwarf trees, a second fan can extend the tower to 5.5 m.
Anyone that’s been stuck in wet weather can appreciate the value in this adjustable double axle. Weight is distributed to reduce compaction and hopefully, the creation of ruts. This feature is standard, but you have the option to upgrade to hydraulic adjustment. 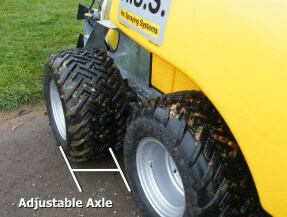 I’m not sure how often an operator would want to adjust the axle length, but there it is. The H.S.S. CF has a lot of features that promote operator safety by reducing the potential for exposure. 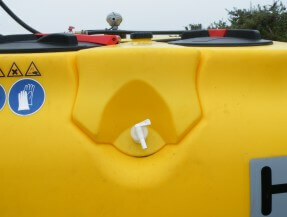 One convenient feature is the access port separate from the tank fill port. No need to remove the basket to examine/clean the interior, and no need to remove the basket and come in contact with (potentially) concentrated pesticide residue. 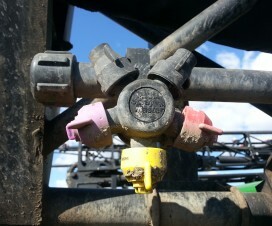 Many large field sprayers feature tank rinse nozzles to facilitate sprayer cleanout following an application. Finally, airblast can boast this feature as well. 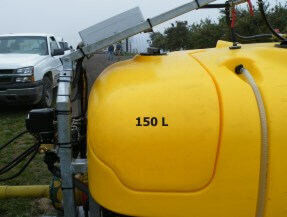 The 150 L clean water tank supplies enough water to the tank rinse nozzles for a triple, low-volume rinse in the field with no need for a pressure washer or a nurse tank. This prevents residue buildup and reduces operator exposure – and it’s standard! 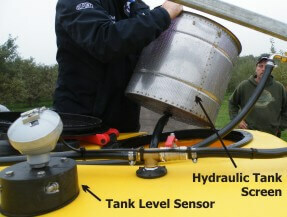 An optional feature is the tank level sensor, which can be tied to the agitation. If you are using a foamy tank mix, agitation won’t turn on until a preset tank level. I’m not certain about this option because proper tank suspension requires agitation from the beginning – just use a defoamer. 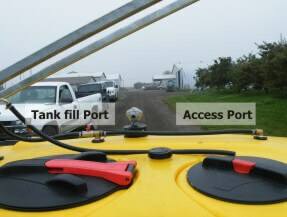 Note the tank basket has a hose attached to the bottom… read on. 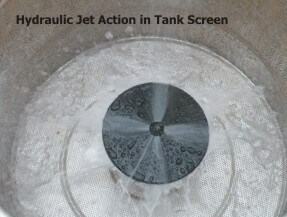 There’s a standard hydraulic jet at the bottom of the tank basket to assist in proper mixing. I don’t know if it precludes mixing a slurry, or if it will improve pesticide bag dissolution, but I have to assume it helps. I trust there’s a safety feature to prevent this nozzle from operating while the hatch is open, but I’m not certain. 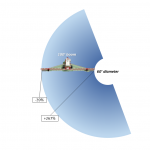 This final standard feature may seem small, but it further reduces the potential for operator exposure. 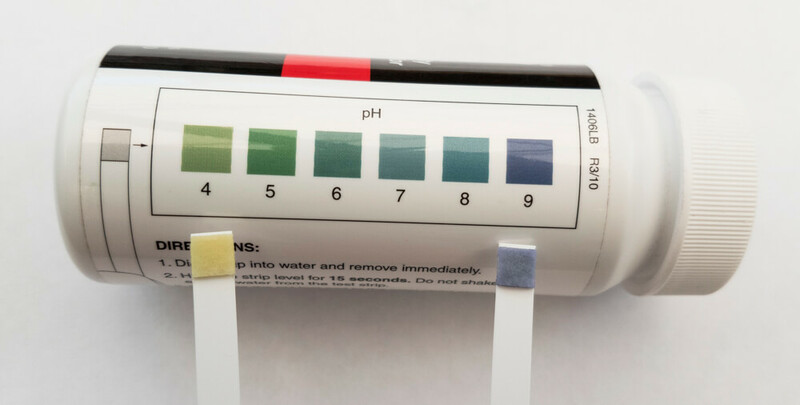 The onboard clean water source is separate from the spray tank and the tank-rinse supply and provides a convenient hand-wash station. 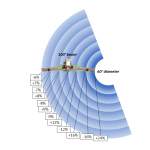 Other features include solenoid shut-offs for boom sections, a rate controller and a small-radius draw bar. An important function of any airblast sprayer is air handling. Too often, tower sprayers have inconsistent air speeds (and presumably air volumes) over the length of the air outlet. Sometimes this can be compensated for using the small deflectors in the tower, or in extreme cases, replacing conventional hollow cone nozzles in “dead spots” with air induction hollow cones that produce coarser droplets and tend to fly farther under pressure. Using a Pitot meter, we examined the airspeed from each air outlet. The PTO was set to 400 rpm and the fan gear was in low. There were no obvious dead spots, and the left and right sides of the tower seemed about equal. The bottom two positions were notably slower than the rest, but given the distance to the target in that position, and the fact that ambient wind is slower at the ground, it’s interesting, but not necessarily a concern. We arranged a set of water-sensitive targets in the canopies of semi dwarf apple trees to get a sense of the sprayer coverage. Admittedly, it was very humid and there was little wind that day, so coverage is much easier to achieve because so little spray evaporated or was blown off course before reaching the target. We ran different combinations of PTO speed and fan gear. These images are from 540 rpm and low fan gear using red Albuz nozzles (1.5 L/nozzle/minute @ 6 bar) spraying about 400 L/ha at about 5 kph. 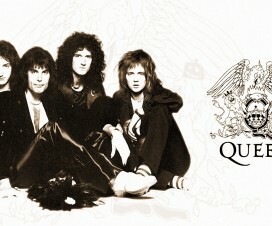 On a drier and windier day, higher volumes would be needed. There were no obvious misses, even when papers were oriented parallel with the ground (exposing their narrow edge to the sprayer, such as in the paper on the right). This isn’t conclusive, but it does show that the sprayer had no trouble penetrating the canopy, and with further tweaking should be able to provide suitable coverage throughout the canopy. Personally, given the upward orientation, I would use the woolly aphid nozzle for all applications, particularly for drenches. More on that later. One notable quality was the “quiet” operation of the sprayer. Applicators are familiar with the loud whine created by most airblast sprayers; at lower rpm’s and in low fan gear, the tractor seemed as loud (or even louder) than the sprayer operation. You can watch a video of one of the spray passes at the bottom of this article. So the big question: “How much?”. You’ll have to contact the dealers to find out more, but I will say that stripped down to standard features, it’s comparable to some of the more expensive sprayers in Ontario. Don’t be dissuaded because I believe the expense is warranted given the features, with particular note of the on-board tank rinse system and adjustable air ducts. So is this the sprayer for you? Well, if you’re in the market for a new sprayer, always start by prioritizing your goals. 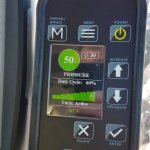 Perhaps work-rate is a priority, so look to sprayer capacity to reduce the number of refills and consider over-the-row technology (where possible) to reduce the number of passes. Perhaps the crop is adjacent to sensitive areas or residential homes and drift control is a priority; consider adjustable air direction and adjustable air speed. 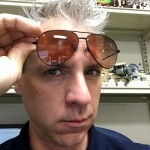 Necessity – Is a new sprayer really needed? Manufacturers have a number of retrofit kits available to upgrade and improve sprayers. 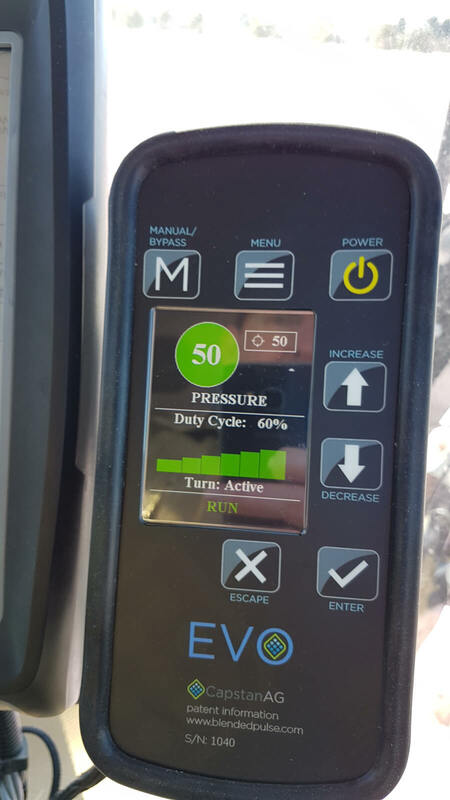 If poor pesticide performance has led to the decision to purchase a new sprayer, be sure it’s related to the technology, and not to an operating error. Crop Type and Acreage – Consider the size of the operation and the size, shape and density of the crop(s). Can the sprayer adapt to provide adequate coverage throughout the growing season and in the long-term? How flexible is the sprayer when spraying different products onto different targets? • Sprayer Capacity and Filling – Fewer refills means a higher work rate, but increased capacity also means more weight, so consider the effects on navigation, turning radius and soil compaction. Is the tank easy to fill? 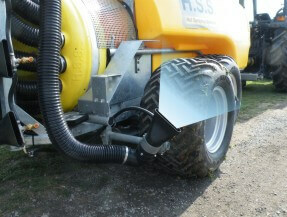 Horsepower – This is an important consideration for airblast sprayers because fans move a lot of air and liquid. Tank agitators require power, too. Consider selecting from the higher range of manufacturer-recommended horsepower to improve longevity. Remember, however, that fans typically don’t have to operate at the maximum rated rpm’s, particularly early in the season. 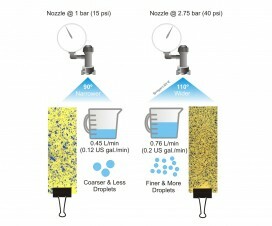 Nozzle Technology and Operating Pressure – Consider the range of nozzle-types intended for use and ensure the sprayer can provide sufficient pressure. While more expensive, diaphragm and piston pumps have fewer moving parts in contact with the spray solution, reducing cleaning time and operator exposure. Spraying Conditions – A sprayer has to be reliable, even in adverse conditions, so consider the operating environment. 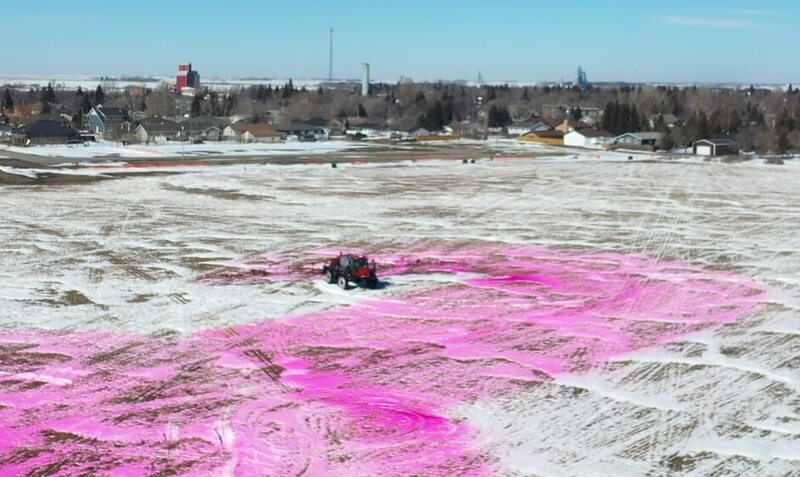 Night spraying, uneven terrain, high winds, dry conditions – many environmental factors can impact sprayer performance and may warrant special consideration. Investigate deflectors, shrouds and the structural framework and durability of the sprayer. Since its introduction in late 2014, growers have been slowly adopting this sprayer in Ontario and the northern US. Some high-density operations have purchased the optional over-the-row boom system that allows them to spray multiple rows at once. Here at at the Simcoe Resource Station, we’re hoping to run the HOL sprayer in apples for the 2016 season to see if the optional woolly apple aphid (WAA) nozzle has any impact on scale, mites and of course, WAA control. Moreover, we plan to run that nozzle all season long to see if its upward angle improves underleaf coverage and canopy penetration. 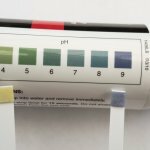 How does pressure affect spray?